Eye-catching eyes pop on a posh porcelain dish. 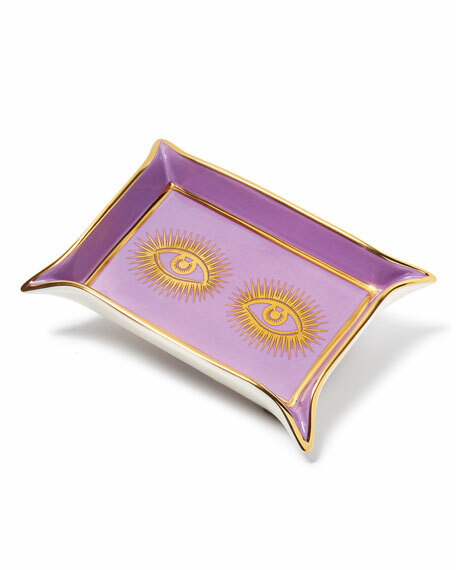 In alluring amethyst, our Eyes Tray reinvents the classic valet tray. It's perfect for corralling your keys on a console, watching over your night stand, or giving you a glimpse on your vanity. High-fired porcelain tray with golden accents. 7"W x 5"D x 1"T.
Preston Modern Tufted Sofa 99"
Clover-shaped tray framed in antiqued finish brass. Inset resin horn bottom in radial pattern. Finished sides. 19.3"W x 13.5"D x 2.5"T. Imported. Stoneware tray. Aluminum handles with hand-painted gold leaf details. Serve hot or cold on this lovely tray. 23.1"W x 10.1"D x 2.5"T. Hand wash. Imported. Mod and monolithic, the Jonathan Adler Canaan Menorah is crafted from solid black and white marble with brass accents. 11.3"W x 2"D x 6.3"T. Hand wash. Imported.